One major western New York employer is giving you two thousand reasons to apply. GEICO offers newly hired sales representatives a $2,000 signing bonus. Employees must complete the training program, and earn their insurance license to be eligible. One major western New York employer is giving you two thousand reasons to apply. 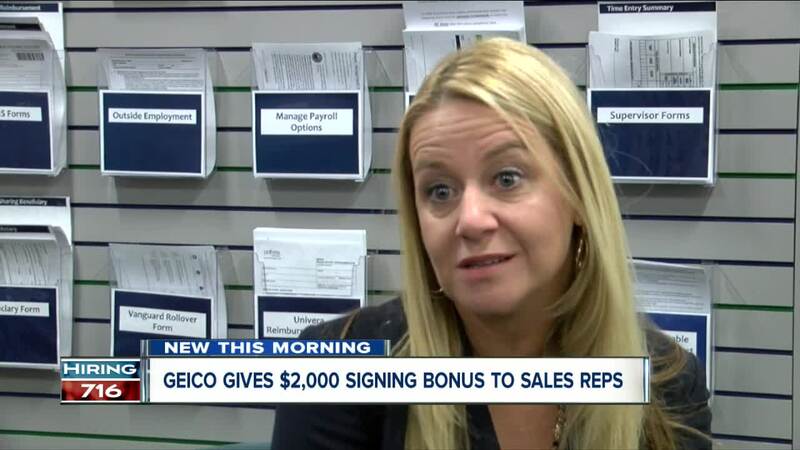 GEICO offers newly hired sales representatives a $2,000 signing bonus. Employees must complete the training program, and earn their insurance license to be eligible. That bonus would have enticed GEICO employees like Jackie Whalen. Whalen applied for the job back in 2014. “The only thing I knew about insurance was buying car insurance,” she explained. That's okay, according to GEICO Human Resources Director, Tricia Dwigun. She said the position doesn't require prior sales or insurance experience. But, you do need a high school degree. You should also enjoy helping others. Dwigun said one of the advantages for GEICO sales representatives is they're not picking up the phone and calling a customer to try and sell a policy. Instead, customers are calling the agents based on GEICO advertisements they've seen before. “You don't have to go find your own business. The phones are ringing all day and all night because customers are interested in our products,” Dwigun said. GEICO has 45 openings across all of its departments. They hope to hire 200 by year’s end. Pay starts at $16.60 an hour. “They're eligible for monthly incentives on top of that. So, it is not a commission structure,” added Dwigun. Last year, the average salary for local insurance agents was $52,000. If you sell 2,000 insurance policies in a year, then the company will send you on an all-expense paid trip to places like Nashville or New Orleans. “These trips alone make it worthwhile just for that being able to go all these different places,” said Auto Sales Insurance Agent, Nick Jahn. Jahn has earned a trip every year for the last 10 years. Jackie Whalen has been on two vacations thanks to hard work, and GEICO. It's one of many reasons why she recommends the job to any job seeker.